Based on end user feedback, 5.11 has updated the adjustable sleeve closure to ensure the velcro functions properly allowing you to adjust the opening as needed. High tech meets tactical with 5.11’s new Sabre Jacket. Bringing you breakthrough technology in outerwear material for law enforcement you and your gear will stay warm, dry, comfortable and ready for any situation. The three layer micro fiber outer material is lightweight, durable, windproof, waterproof, soft, and durable. The soft-shell micro fiber is bonded to tight knit fleece to increase comfort (warmth) then lined for added durability. 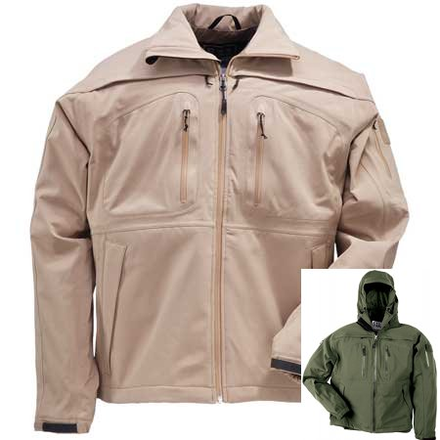 The overall weight of the Sabre Jacket is perfect for all season use and looks great on the job or for casual wear. We’ve included laser cut welded seams and watertight YKK zippers with molded ergonomic zipper pulls and zipper garages. No need for zipper flaps which make the Sabre Jacket lighter and provides quicker access to pockets. This also provides a very clean and professional look. Six external pockets make it easy to stow all of your gear. Two internal pockets give quick access to a concealed firearm. The two front hand pockets are lined with fleece to keep your hands warm and dry. The removable hood with reinforced visor can be removed and concealed ID panels on left and right chest can be imprinted with department logos or removed all together. The front panel measures 5" W x 5 1/2" L. The back panel measures 12 1/2" W x 9" L.